Note: This page is not quite complete yet. Thank you for your patience and please check back soon. Started on Sept. 12th 1948 (Showa 23) and were issued up until May of 1982 (Showa 57). Kicho origami were issued at the main office and local branches. Kicho means "precious" and the literal meaning of nintei-sho is recognition in the from of calligraphy. 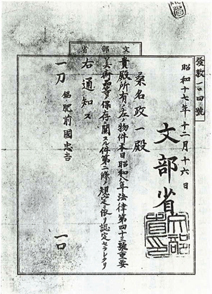 This type of NBTHK paper is commonly called a "white paper". This was the only rank issued until 1950. 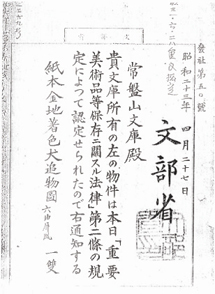 After that, it was issued as the rank below Tokubetsu Kicho. Started in March of 1950 (Showa 25) and were issued up until May of 1982 (Showa 57). Tokubetsu Kicho origami were issued at the main office and local branches. Tokubetsu Kicho means "especially precious". It was the top rank until the Juyo paper was introduced in May of 1958 (Showa 33). This type of NBTHK paper is commonly called a "green paper". 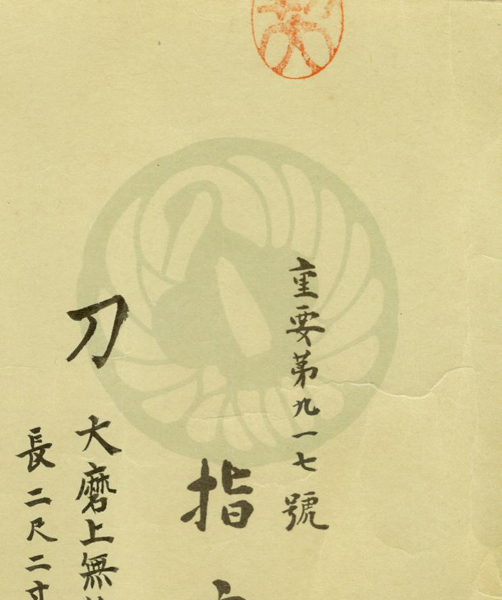 The green paper and the round seal bearing the kanji of "Toku" was first used on Tokubetsu Kicho papers starting in July of 1950 (Showa 25) and remained that way until 1982. On September 1st, 1973 (showa 48) the Koshu Tokubetsu Kicho paper (blue paper) was introduced and was issued as a rank above Tokubetsu Kicho but below Juyo. 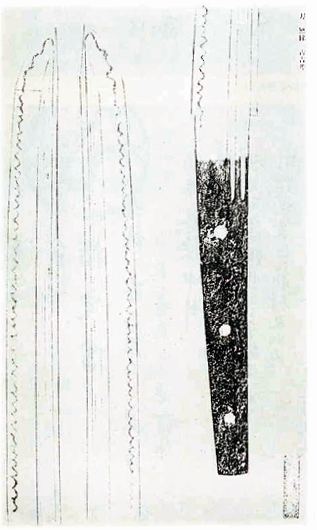 The example above is a Tokubetsu Kicho paper for a kozuka. A step by step breakdown of its meaning is as follows. 1. These three kanji are pronounced "ninteisho". The literal meaning of "nintei" is recognition. The third kanji of "sho" means calligraphy. 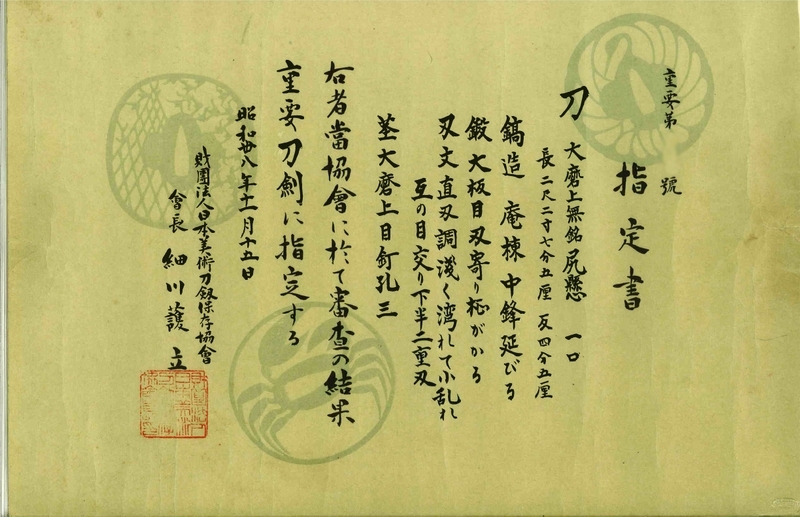 So, the phrase "ninteisho" is introducing the document as recognition written in calligraphy. 3. The section begins the description of the item. 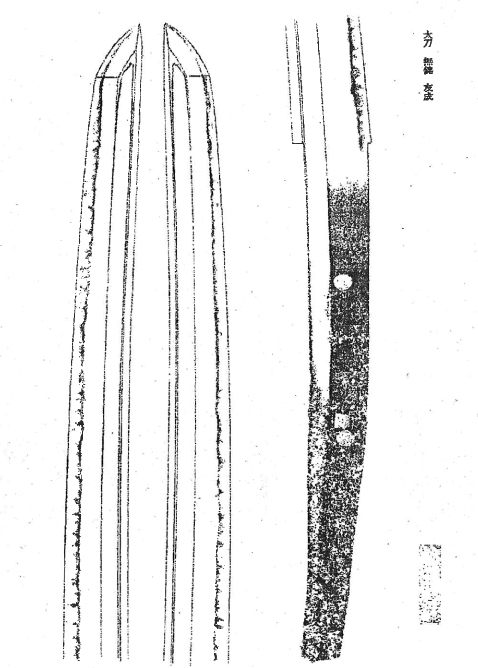 In the case of a sword bade, the type of blade would be stated here. This particular paper is for a fitting. With fittings, this section can be slightly more descriptive than a paper for a blade. The first kanji is a single horizontal stroke and means "item". This is used on all NBTHK papers. The next is pronounced "semi" and means cicada. (The cicada is the insect being depicted on this item). The square kanji that follows is pronounced "zu" and means theme. The last two kanji are "kozuka". "Ko" means small and the ending kanji is from the word "tsuka" meaning handle. Translated in English it says this item is a small handle done in the cicada theme. 4. This area would state the signature of the maker if the item were signed. 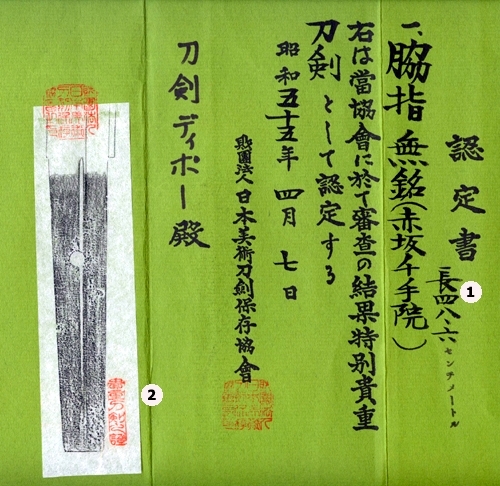 In this case, the kozuka is unsigned so we see the kanji of "mu mei". "Mu" means no or absent and "mei" means signature. When an item is mumei, an attribution is given to a school or even a particular maker in some cases. Typically the attribution is given in parenthesis. That is the case here and this attribution states "Ko Goto". In this context, the meaning of "ko" is old. "Goto" is a famous school of fitting makers. 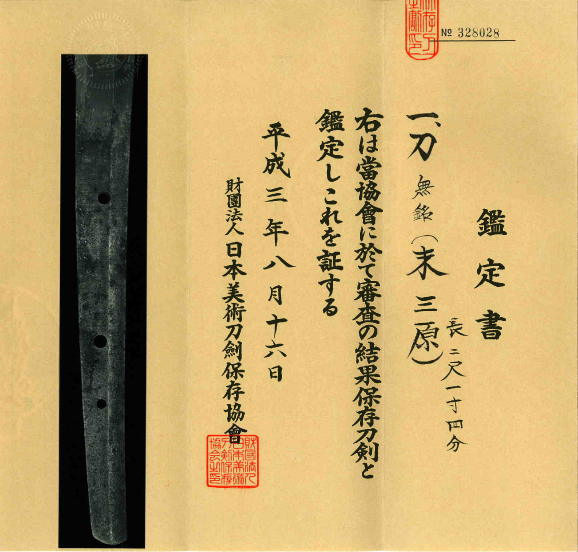 The use of the term ko in the context of Goto is to state clearly that this kozuka was made before the Edo period. The second line of section 4 states "Shakudo Nanako Ji Takabori Iroe". 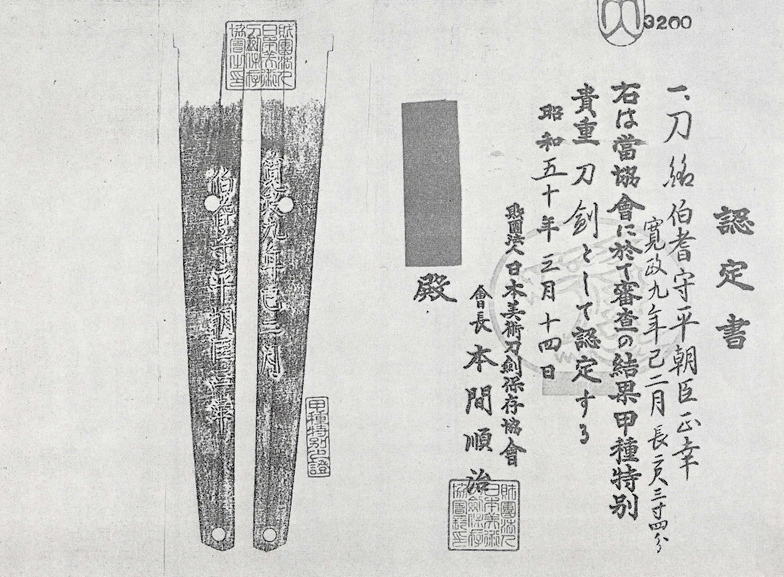 This is describing the kozuka further by explaining the style of manufacture. Basically, "Shakudo" is the material (soft metal alloy), "nanako" refers to the dots that appear like rows of fish eggs and "Ji" means ground or base. "Taka" means high and "bori" is to carve or scoop out. These kanji together are normally translated to indicate high relief carving. "Iore" means literally colored picture. More specifically, the Nihonto Koza, translated by Harry Watson, explains that "iroe" actually refers more to the method in which the inlay, in this case gold, is retained. 5. This section appears very similar on most NBTHK papers. The only variables are the rank and the item. In this case the rank is "Tokubetsu Kicho" and the item classified as "kodogu". The meaning of kodogu is "small metal fitting". The pronunciation of this section is: Migi wa tokyokai ni oite shinsa no kekka tokubetsu kicho kodogu nintei suru. The meaning of this that the result of examination by the Tokyo branch has resulted in the decision that the item to the right is an especially precious small metal fitting. 6. This is the date that the paper was written. This one is dated Showa, 49th year, 12th month, 8th day. This equates to December 8th 1974. 8. 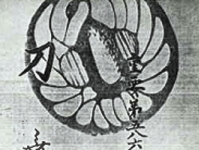 This states : "Zaidan Hojin Nihon Bijutsu Token Hozon Kyokai". Zaidan Houjin means "non-profit organization". 9. The name of the owner or agent who submitted the item appears here. Normally, this is covered when a paper is shown in a public forum such as the internet. 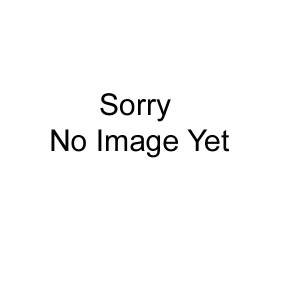 Often times, this section is erased by the owner of the item when it is sold. 10. This is the same seal as in number 7. In this case, it is stamped on two different items at the same time (the paper and the photo). Each the half of the seal matches the other. The purpose of this is to discourage counterfeit photos (or papers). 11. The serial number of this paper. 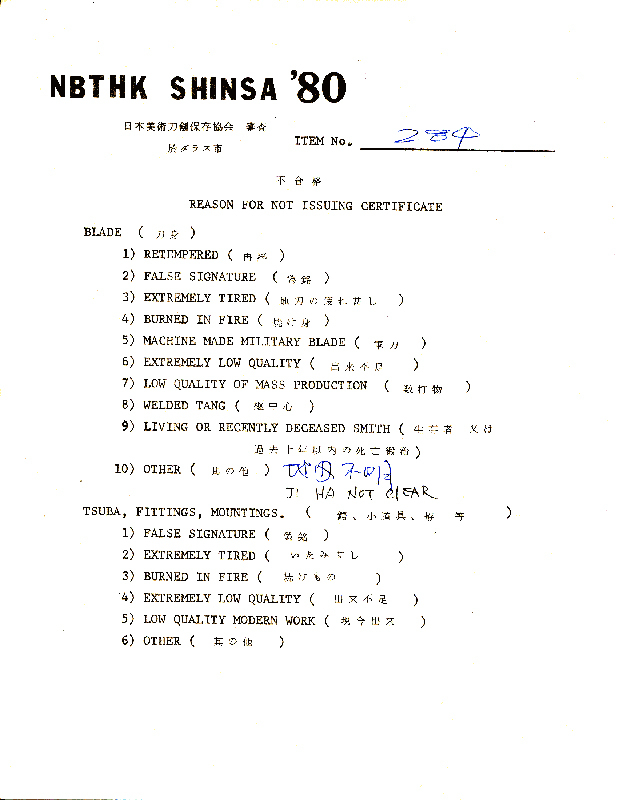 In case of older papers, the count is probably of items within one shinsa. 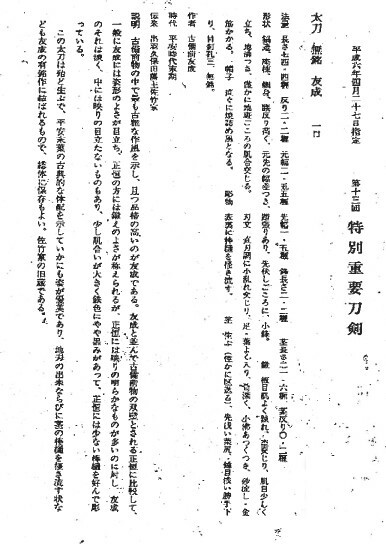 Below is an example of a 1967 Tokubetsu Kicho paper. It has the name Mr. Hosokawa, the founding chairmen of the NBTHK printed on it to the left of the NBTHK's name. 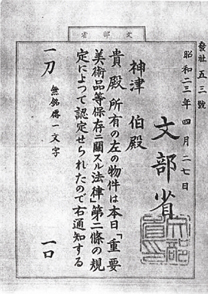 The highest level paper available at the 1980 US NBTHK shinsa was the Tokubestu Kicho (green) paper. 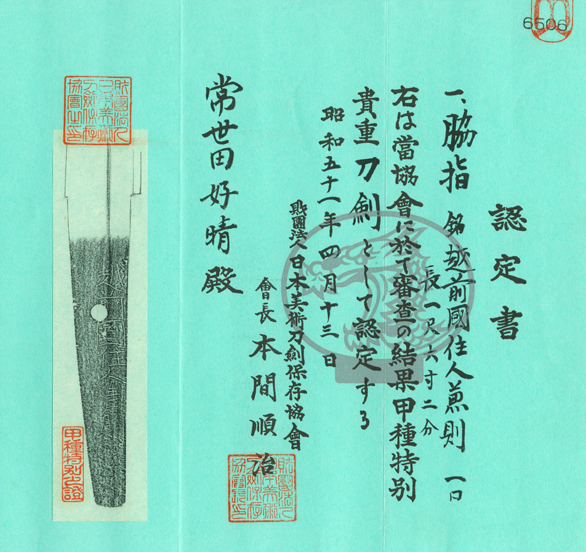 Koshu Tokubetsu Kicho (blue) papers were not awarded at that shinsa. Please see the photo of the working paper below the origami. It shows that the three levels available at the shinsa were either rejection, Kicho or Tokubestu Kicho. 1. The nagasa of the blade. 2. 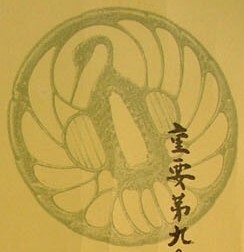 Seal: This states "kicho token no sho"
Started in Sept of 1973 (Showa 48) and was issued up May of 1982 (Showa 57). Koshu Tokubetsu origami were issued at the main office and local branches. Koshu Tokubetsu Kicho can be translated to mean "superior of the especially precious". This type of NBTHK origami is commonly called a "blue paper". It was the highest rank below Juyo throughout its use. Local Branch Shinsa was terminated in 1972 (Showa 47) but got revived in June 1974 (Showa 49). However, it was terminated again in 1980 (Showa 55) due to an incident involving the Japanese Mafia. The current shinsa system began in September of 1982 (Showa 57) and is in use to this day. In the new system, Shinsa is conducted at the main office only. The new ranks were called Hozon and Tokubetsu Hozon. Hozon means "worthy of preservation". Tokubetsu Hozon is one level higher and means "especially worthy of preservation". These two ranks replaced all previous ones below Juyo. 1. This section differs from the older papers. The kanji for "Kantei" appears here instead of "Nintei". The meaning of "Kantei" is appraisal. As discussed in the examples above, "sho" means calligraphy. Therefore, the literal meaning of phrase "Kanteisho" is to introduce this documents and an appraisal written in calligraphy. There is a common misconception among western Nihonto students that "Kanteisho" means written expert opinion. That is incorrect. 2. This section records the length of the blade. This measurement is taken from the mune-machi to the tip of the kissaki and is called the nagasa. 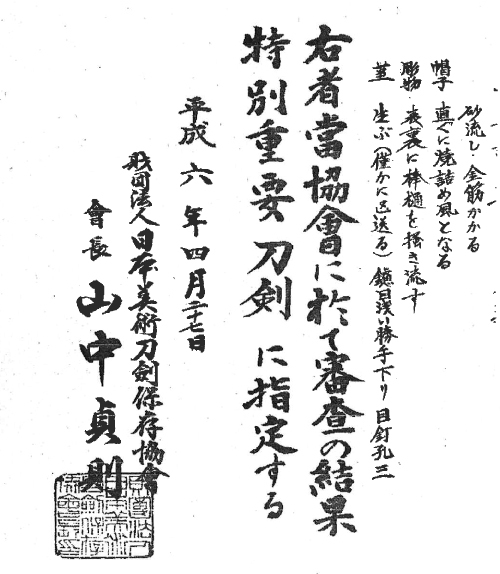 This paper states "nagasa 2 shaku 3 bu kyo." (Kyo means "slightly more than"). Translated into English, this line explains that the length from the mune machi to the tip of the kissaki is slightly more than 61.509 cm. 3. This section begins the description of the item. In this case, the item is a katana. 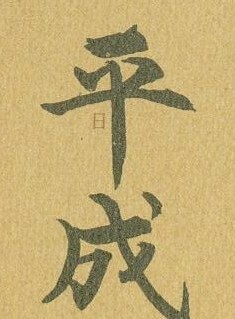 The first kanji that appears as a single horizontal stroke means "item". The kanji immediately below it means katana when it is used in this context. It can also be pronounced "to" and be used as a general term for sword. 4. 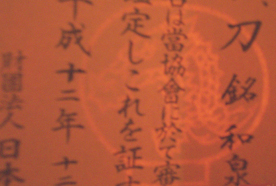 This section states the mei (signature) of the maker as it appears on the blade at hand. This one states "mei Izumi no kami Kunisada". 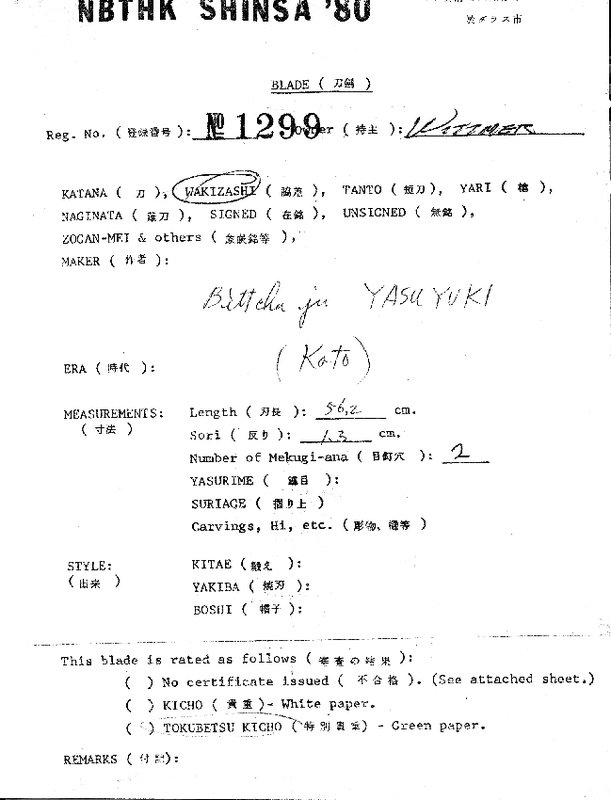 When a blade is unsigned or has lost its signature due to shortening, the kanji for "mu-mei" would appear here and a attribution to a specific school or smith will be given in parenthesis. It is also interesting to note that this blade was shortened at some point in its history (this sword is about 385 years old) and great care was taken to retain the original signature and file marks. 5. If the NBTHK wishes to state specific information about the item at hand, this is where it appears. It is somewhat unusual for the NBTHK to give specifics. When information appears here, it is important and should be carefully noted. The additional information, if present, is given in the form of parenthesis and that is the case here. This states "Sho-dai." The meaning of this is to indicate that the exact maker of this blade was the first generation Kunisada. He is the Jo Jo saku rated co-founder of the Osaka Shinto school and father of the famous smith, Shinkai. Shinkai's early works bear this same Kunisada mei. 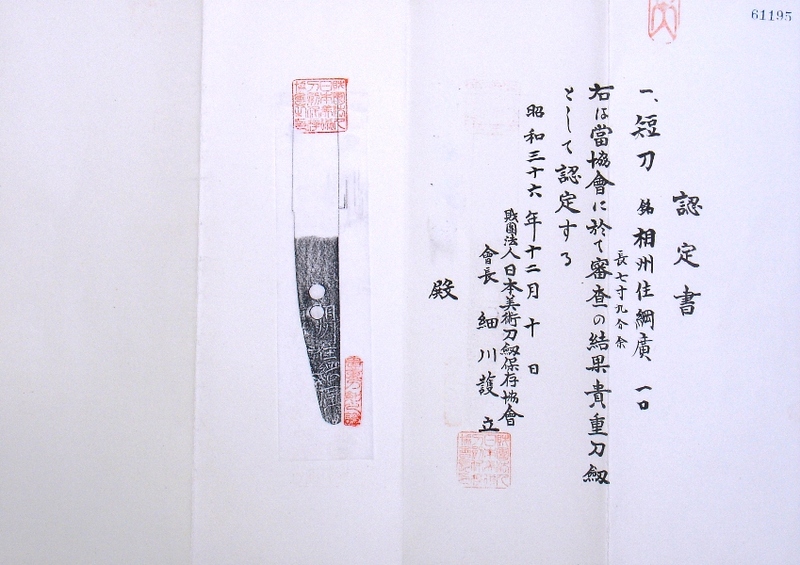 The use of "shodai" here is to makes a clear statement by the NBTHK that this blade is by the father. 6. This section appears very similar on most NBTHK papers. The only variables are the rank and the item. 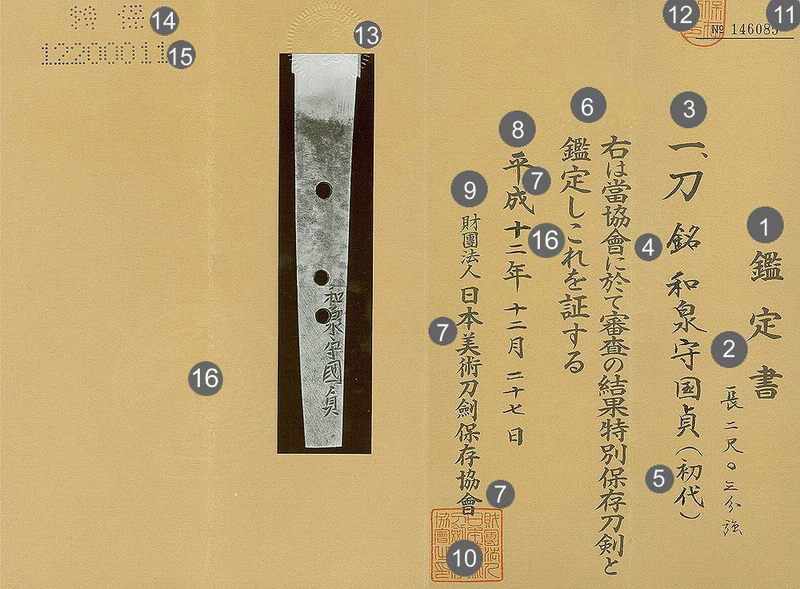 In this case the rank is "Tokubetsu Hozon" and the item is classified as "token" (sword). The pronunciation of this section is: Migi wa tokyokai ni oite shinsa no kekka tokubetsu hozon token kanteshi kore wo shosuru. 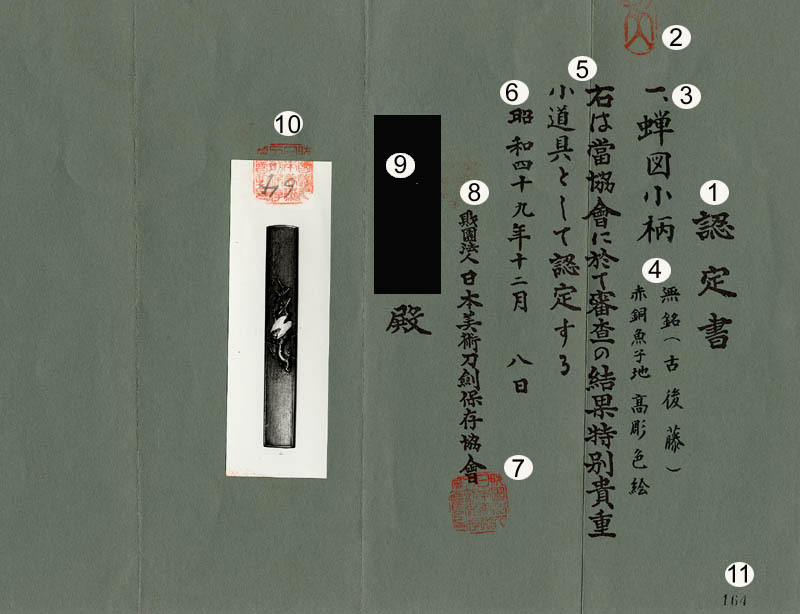 The meaning of this is that examination by the Tokyo branch has resulted in the decision that the item to the right is a sword that is especially worthy of preservation. 7. This is an important security feature. This feature was not included in the beginning of the current Hozon shinsa system. The exact date of its inception is being researched. One has to look very close to see this feature. 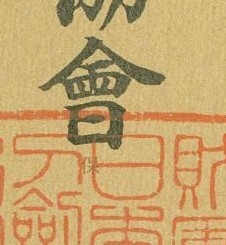 Tiny brown kanji that are similar to the same color as the paper state "Ni", "To", and "Ho". These are placed in specific areas noted on the photo. The reproduction of these kanji would be very difficult. Therefore, it is a considerable guard against fraudulent papers. 8. This section records the date that the paper was written. It states: Heisei 12th year 12th month 27th day. This equates to December 27th, 2000. 9. This section appears the same on most NBTHK papers. Its purpose is to state that the paper was produced by the NBTHK and that the organization is officially recognized as an "incorporated foundation". The pronunciation of this line is "Zaidan Hojin Nihon Bijutsu Token Hozon Kyokai". The meaning of Zaidan Hojin is "incorporated foundation". 15. 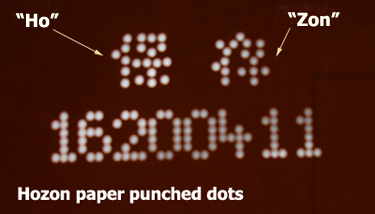 Punched dot date 12200011 = "November 12th 2000"
16. Water mark security feature. 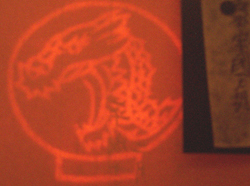 Holding the paper up to a light source will reveal the official logo of the NBTHK in the two places specified. 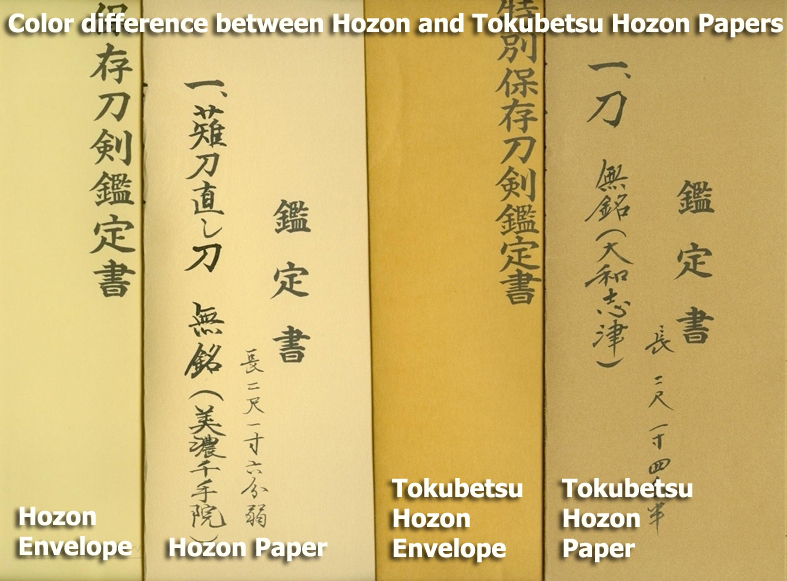 Differences between Hozon and Tokubetsu Hozon Papers at a Glance. 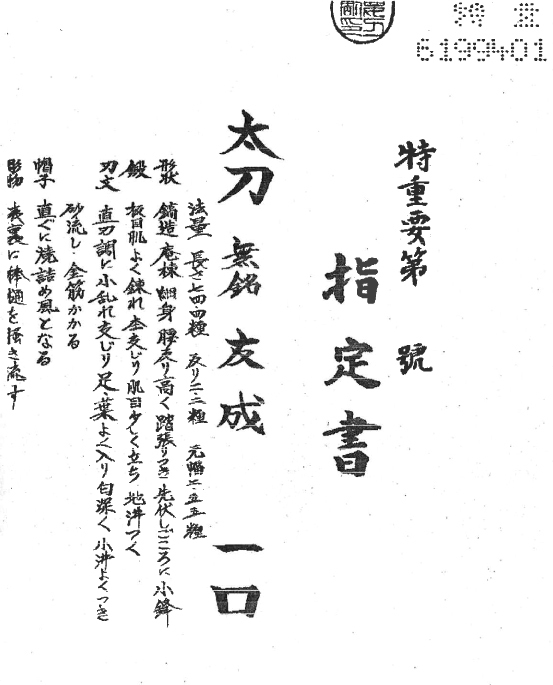 In addition to the kanji in section 6 above being different, the color of the paper and envelope as well as the punched dots from section 14 above are different. 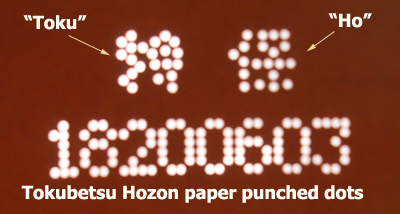 I should also note here that early Hozon papers are a bit darker than recent ones and they do not have any punched dots. Introduced in May of 1958 (Showa 33). Juyo means "important". Started in December of 1971 (Showa 46) Tokubetsu Juyo means "especially important". This is a fake Koshu Tokubetsu Kicho paper that was published by the NBTHK in 1979 to alert people the problem of false origami. This image was published in black and white. The blue color of the paper as well as all of the stamps and seals are exactly like a genuine paper. The only difference is the handwriting. It may also be worth mentioning that the position of the nagasa is unusual. 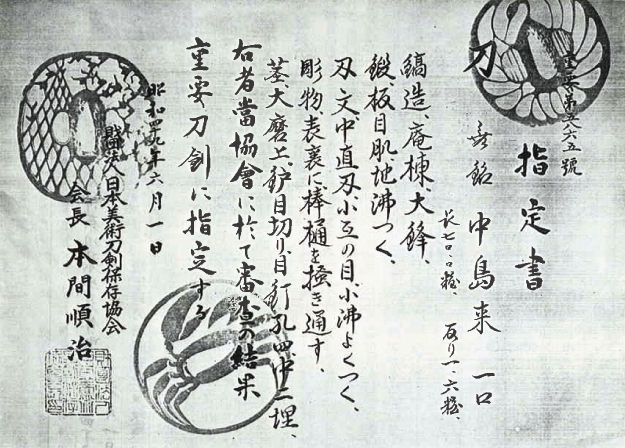 Fake Juyo paper images published by the NBTHK to alert people to this problem. 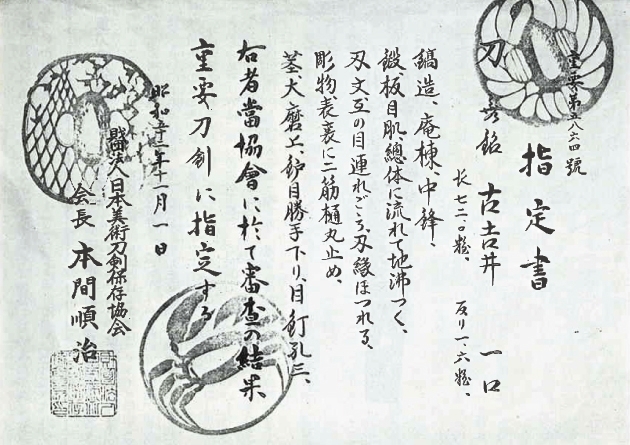 A key to identifying this type of fake Juyo paper is that the false one uses a halftone on the background tsuba images. A real Juyo paper has a more monotone background. The last two images below are shown in black and white. Also, its worth mentioning that the hitsu ana of the background tsuba are different. 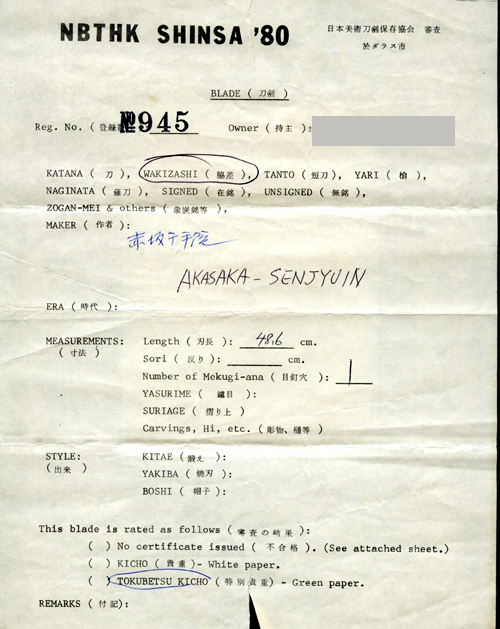 There are several variations of the background used throughout the history of Juyo papers. Note the different ryo hitsu on the real examples below. More research needs to be done to know what the correct back ground design should be for each paper. From Heisei 3(1991). 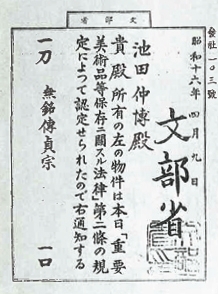 This Juyo paper was issued when Yamanaga Sadanori was the president. This is a fake. The reproduction of the oshigata is not good. Specifically, the details are poor and the overall printing quality is low. One real and three fake Juyo Bijutsu Hin Paper images published by the NBTHK to alert people to this problem. 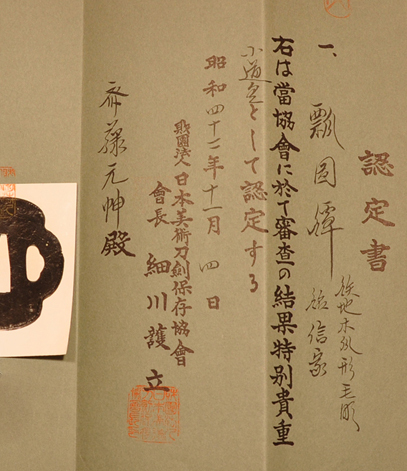 The fake Juyo Bijutsu Hin papers have different hand writing than the real thing.